"Zero" redirects here. For other uses, see Zero (disambiguation). 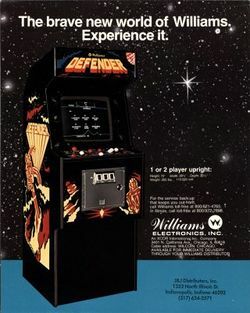 Defender is considered one of the most challenging arcade games ever made. One look at the controls was enough to send many players in search of a simpler game. But those who were brave enough to attempt it found a compelling and addictive game, with an incredibly rich level of strategy. Defender was the brain child of early (and continuing) game developer Eugene Jarvis. Eugene wished to make a video game that immersed the player more than the myriad of Space Invader clones that flooded the markets, and by many experts' accounts, he succeeded. Defender featured a beautifully horizontal scrolling world, something that was a rarity in its day, and made Defender unique among space shooters. Because the "world" was larger than the screen, Defender also featured a scanner at the top of the screen to give players indications of what was taking place off screen. In addition to the space craft's primary laser weapon, it had a limited supply of smart bombs that could wipe out everything on the screen, and a hyperspace ability. The control scheme for the game matched the complexity of the abilities available to the ship. The Defender's job is to protect the remnants of humanity from a marauding band of alien invaders who wish to abduct the human race. Landers swoop down to the planet terrain and tractor beam a human to them, and then rise in to the sky with it. A cry for help alerts the player to fly to its rescue as quickly as possible. Either the player shoots the Lander and rescues the human, or the Lander merges with the human at the top of the screen and becomes a deadly mutant. A grim fate awaits the player who fails to keep humanity safe. The break-neck pace of the action made the game an easy choice for Atari to buy the home licensing rights. They brought a conversion to the 2600 that was generally well received, despite its shortcomings. But the version created for the 8-bit family of Atari computers was lauded as one of the best. Defender was also one of four games produced for the Entex Adventure Vision, a standalone system that accepted cartridges. In fact, it was the system's pack-in game. Atarisoft handled the conversion of the game to several other home console and computer platforms. A few years later, the sequel Stargate would be released, but due to licensing issues, it was commonly known as Defender II. Defender was also released for download on the Xbox Live Arcade in 2006. The story is simple: You are the last line of defense against an invading legion of aliens who are determined to abduct all of the remaining humans to create an unstoppable army of hyrbid mutants. You pilot the only space craft capable of undoing their plans and protecting the fate of human life.